St. Seiriol the Fair was a younger brother of Kings Cynlas of Rhos and Einion of Lleyn. He entered the religious life and lived in a small hermitage on the Eastern Peninsula of Ynys Mon (Anglesey). His two ruling brothers later decided this humble residence was far too lowly for their Royal brother and founded an important monastery around his cell. 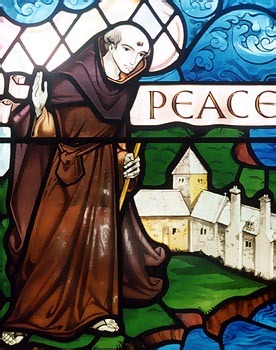 Thus, Seiriol became the first Abbot of Penmon Priory. His hermitage and holy-well can still be seen there today. Seiriol became a great friend of St. Cybi who lived at Caer-Gybi on Ynys Cybi (Holy Island) on the far side of Ynys Mon (Anglesey). The two would often walk several miles to meet up for prayers at the Clorach Wells in Llandyfrydog in the centre of the island. This journey with his back to the sun allowed St. Seiriol's complexion to remain so fair that he was given the epithet of "Gwyn". In old age, Seiriol retired to Ynys Lannog (Priestholm), just off the coast from Penmon. It became known as Ynys Seiriol in his honour, though it is now better known as Puffin Island.